Computer network security is a big concern these days, for individuals and for businesses. Many small businesses don't have a lot of security expertise on staff. Some think that hackers are only after the big targets, but that is not the case. Results from Symantec, the Computer Security and anti-virus software development company, show that about 40 percent of cyber attacks recorded in one year were targeted to small businesses, those with fewer than 500 employees. 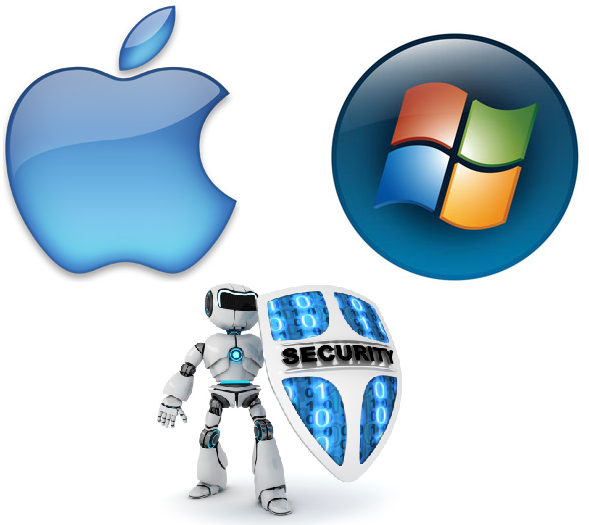 Here are Top (7) Seven Best Network Security Tips to Enhance and Improve Business Computers / Laptops Security on Mac OS X and Windows operating systems i.e. Windows 8.1 / Windows 8 / Windows 7 or OS X Yosemite v10.10 / OS X Mavericks v10.9 / OS X Mountain Lion v10.8 etc. Some companies are overconfident when it comes to security. Either they think they've taken adequate steps already, or they think there is no major security risk exist, But they actually don’t know that the security risk does happen to many businesses, and hackers are sophisticated these days. When you consider the risk, think of all the ways your business could be impacted, such as the downtime due to a virus or attack, cost of fixing the problem, loss of productivity for employees, loss of sales when systems are down, leaks of important company data, and damage to reputation if someone steals customers' private information. Any employee can unwittingly introduce or spread a virus in your systems, just by opening an e-mail attachment, clicking on an unwise link, or entering login information into a phishing site. Once a virus has an entry point, it can spread easily. Earlier this year, the Canadian Treasury Department had to seal off employee internet access after a virus was spread by simple emails within the organization. Make sure everyone in the company is trained on what to watch for. One of the simplest and most efficient ways to see if your business has been cyber-compromised is to scan your network. Train your employees to use a scanning tool; among one of the most popular is the Nmap tool, which is open source. If you're using Windows, the tool also consists of a graphical user interface to help you check open ports that should be closed. Another entry point for malware is hard working employees who take files home with them so they can work at night. What can happen is that somebody copies a work file to USB, takes it home, and loads it onto their home computer. If their system is not well protected with anti-virus software and firewalls, then the file could be compromised on their computer. They will bring the updated file back to the office, and put it on the company system, where it can begin doing damage. There is no doubt that installing software updates for the operating systems on servers, desktops and laptops takes time, but delaying these updates can be a problem. This is the most common security problem for small companies. The software update patches are created to close newly discovered security holes. When the updates are not installed, you have Security vulnerability. Upgrading your company's software systems is the best way to stay protected from cyber attacks. It's a matter of increased security, employee morale and productivity. Periodic updates are paramount for business and renewing employee software will help you steer clear of unnecessary expenses down the road. Unfortunately, most CEOs and company owners see these updates as useless investment decisions, so they postpone the process for as long as possible to avoid stopping the productivity and spend money. Assuming that nobody will want to hack into you network is a mistake. When employees use a simple password like "password" or their last name, it makes it easy for hackers to figure out how to get into the system. Another problem is when people within a department share the same password. This makes it impossible to find out what happened in the event of a problem. Set up password standards for the length and complexity of passwords, and have a policy against sharing of passwords. When a hacker wants to gain access to your network he first checks for open ports. These ports are specific mechanisms through which your business network connects to the World Wide Web. For a hacker, an open port is like a tempting invitation for exploitation and direct access. Businesses can avoid all this from happening with the help of a firewall. When they're properly configured, firewalls are almost unbreakable. If you want to see if your business network already has firewall capabilities, log into your device's router and check for setting for Security or Firewall. A small business network cannot be protected 100% with a firewall. An IPS can have a vital role in the security of your business. An Intrusion Prevention System monitors traffic flow and it looks for anomalies that could lead to malicious activity. IPS technology can also be made part of a UTM device (unified threat management tool). Now it all depends on your company's size and amount of information you want to keep safe. In some situations, using a separate physical box is recommended. Intrusion prevention systems are extensions of some other systems known as intrusion detection systems. Their job is to monitor system activities and network traffic in search of malicious activity. Above everything else, a company should also perform a gap analysis of its security system. The purpose of such assessment is to offer a benchmark and figure out if your network security level needs improvement. Whatever the size of a business, it's really important for managers, CEOs and entrepreneurs to pay close attention to the safety of their network. Making sure that your data is safe and sound will help you sleep better at night. Hackers are lurking, so why should you take any risks? You can check out various IT Support Services firm for business network security online.